Designing a new generation mobile poultry housing system: that was the main principle when developing our mobile poultry houses for modern and future-oriented agriculture. Our aim is to design a labour-saving, species-appropriate and easy to use mobile housing system for profitable and sustainable agriculture. farmermobil® fm range features mobile layer housing for organic and free-range farming systems (conventional farming). Depending on their configurations, the mobile FM series housing systems are designed for housing 600 to 2,000 animals. The middle section of our fm-Series is the heart of these mobile poultry housing systems. It contains all the technology and equipment used in the housing system. The front area houses the technical room which contains the housing system's own computer, that controls all technical systems, as well as the feed silo, the water tank with associated fixtures and fittings and the drives for the feeding system. The aviary, which extends over two floors, is in the central area of the middle section. This is equipped with floor grates, perches, family tilting floor nests, manure and egg conveyors, as well as the feed and water lines. There are doors at the rear of the central section to remove the manure from the manure belt. In order to ensure the mobility of the mobile poultry housing system, scratching areas with solid floors, that seem to hover along with the middle section, are attached to both sides of the middle section. They can be easily and safely transported with a forklift attachment. The side parts contain the covers of the nests as well as the access doors to the interior of the mobile house. The birds have room to scratch in the side parts. Their plug connections enable the side parts to be swiftly and easily installed and removed. When moving the housing system over a long distance, the side panels can be removed after emptying the house and the middle section and the side panels can then be moved to the new area. The fm-Series mobile poultry housing systems have a modular design. This means that all these mobile housing systems - regardless of their size - contain the same equipment and fittings and fixtures and offer the same functionality. The mobile poultry housing system consists of a middle section and - depending on its size - two to four side sections on each side. The middle section is permanently installed on a chassis. Scratching areas with solid floors, that seem to hover along with the middle section, are attached to both sides. The fm-Series mobile poultry housing systems are designed and built for self-sufficient operation. Storage tanks in the vehicle supply feed and water to the animals. All motor drives in the mobile housing system run on 24V. The energy required for automatic operation is provided by batteries in the vehicle which can be charged by a 230V connection or alternatively via a photovoltaic system. This enables emission-free and sustainable housing system operation. The mobile housing systems are operated fully automatically by their own state-of-the-art computers. The housing system computer regulates the lighting and the automatic opening and closing of the outdoor access flaps and tilting floor nests, as well as the operation of the ventilation and feeding equipment in the housing system, based on time and/or temperature control. If there is a malfunction, this computer automatically sends a text message to the farmer's, or a farm hand's, phone. Alternatively, the mobile unit can also be monitored and controlled via a WLAN. The high degree of automation gives farmers more time to devote to their animals and to optimise animal welfare. Each mobile poultry housing system is designed as a vehicle with a permanently installed chassis. Each fm-Series mobile poultry housing system is also equipped with several hydraulically and individually adjustable support legs so that it can be put in a stable and level position, even on slopes. The mobile poultry housing systems can thus be easily moved and adjusted flexibly, enabling the available pastures to be used optimally and any excessive input of nutrients into the soil to be avoided. 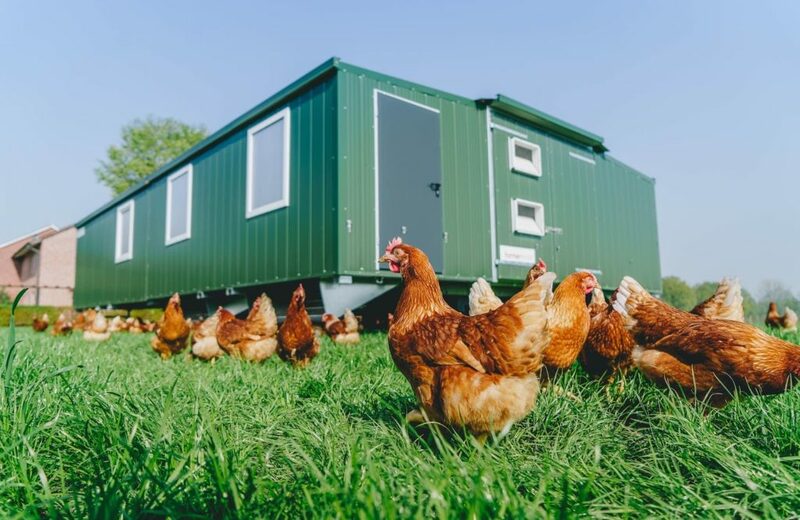 The fm-Series mobile poultry housing systems offer completely new options for species-appropriate housing to both newcomers as well as experienced poultry farmers. Our mobile poultry housing systems for layers have several advantages over conventional fixed free-range housing. In a farmermobil®, the layers live on two levels where they are supplied with feed and water. Many, well-distributed perches are available for the chickens to rest on and enjoy the daylight coming in through the large windows in the housing system. To ensure that the air in the mobile housing system is kept pleasant at all times, the system self-ventilates several times a day. To satisfy their pecking and scratching behaviour, the hens can be given the opportunity to graze on a fresh meadow every day and have large and protected scratching areas available in the side panels. In the daytime, the hens can reach the green pasture from there, and roam around freely. In the evening, the hens return to the mobile poultry housing system where they can spend the night safely and comfortably. Your layers will thank you for their pleasant living conditions with fresh eggs almost every day. farmermobil® STARTER range features mobile layer housing for organic and free-range farming systems (conventional farming). Depending on their configuration, the mobile poultry housing systems in the STARTER series can house 230 to 450 animals. The STARTER-Series features roadworthy mobile poultry housing systems designed as trailers. Each farmermobil® mobile poultry housing system has the same fittings and fixtures, regardless of the size of the system. A STARTER mobile poultry housing system offers you the same technical facilities as an fm-Series housing system, from its own computer, self-sufficient operation, storage tanks and a photovoltaic system, to the manure removal by the manure belts. The STARTER-Series mobile poultry housing systems are complete systems, that are delivered ready for use and give farmers the perfect start to species-appropriate and profitable poultry farming. Each mobile poultry housing system in the STARTER-Series is designed as a trailer with a permanently installed chassis. 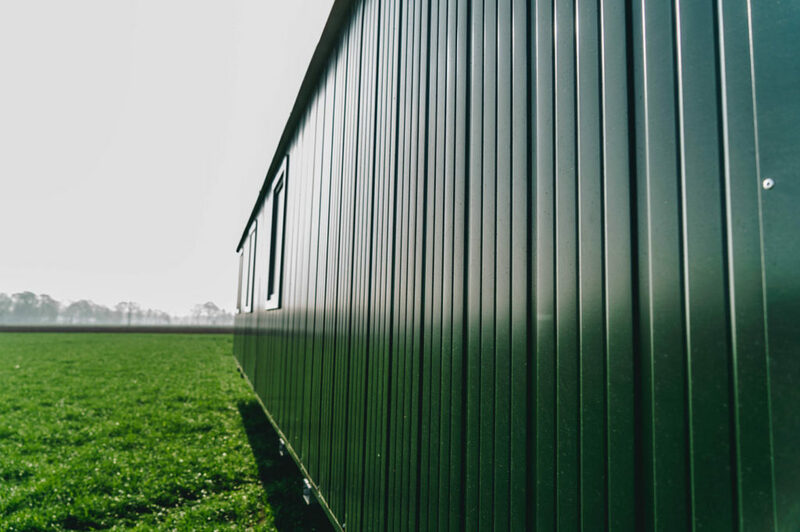 In addition, the STARTER mobile poultry housing systems are approved for use on public roads, which means that pastures that are at a great distance from the farm can also be reached and grazed on. Their low overall weight and their off-road tyres enable the mobile poultry housing systems to be easily moved and flexibly adjusted, so that the available pastures can be used optimally and any excessive input of nutrients into the soil can be avoided. The mobile housing systems are operated fully automatically by their own state-of-the-art computers. The housing system computer regulates the lighting and the automatic opening and closing of the outdoor access flaps and tilting floor nests, as well as the operation of the ventilation and feeding equipment in the housing system, based on time and/or temperature control. If there is a fault in the system, this computer automatically sends a text message to the farmer's, or a farm hand's, phone. The high degree of automation gives farmers more time to devote to their animals and to optimise animal welfare. STARTER-Series mobile poultry housing systems are designed and built for self-sufficient operation. Storage tanks in the vehicle supply feed and water to the animals. All motor drives in the mobile housing system run on 24V. The energy required for the automatic operations is provided by batteries in the vehicle, which can be charged by a 230V connection or alternatively via a photovoltaic system. This enables emission-free and sustainable housing system operation. STARTER-Series mobile poultry housing systems are delivered completely assembled and are therefore immediately ready for use. The layers can move into their new home shortly after delivery. No long and expensive construction time is required. You will also be given detailed and individual instructions, so that you can start without any questions and get straight to work. 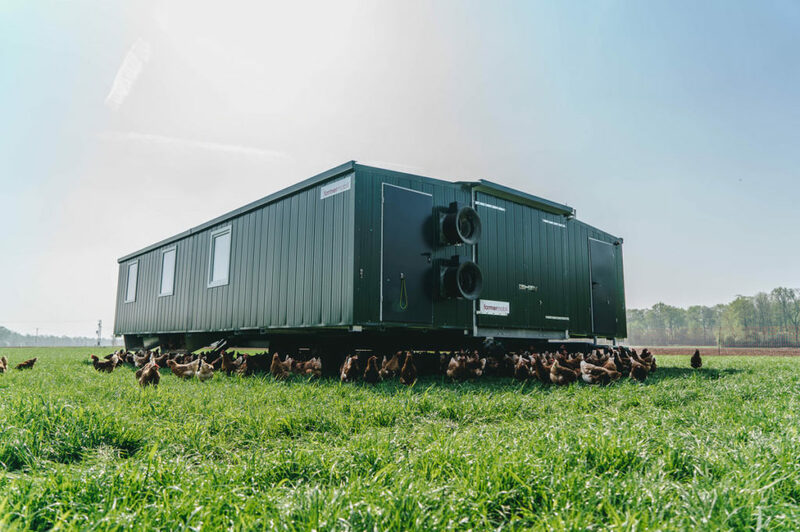 The fm-Series mobile poultry housing systems offer completely new options for species-appropriate housing to both newcomers as well as experienced poultry farmers. Our mobile poultry housing systems for layers have several advantages over conventional fixed free-range housing. In a house, the layers live on two levels where they are supplied with feed and water. Many, well-distributed perches are available for the chickens to rest on and enjoy the daylight coming in through the large windows in the housing system. To ensure that the air in the mobile housing system is kept pleasant at all times, the system self-ventilates several times a day. 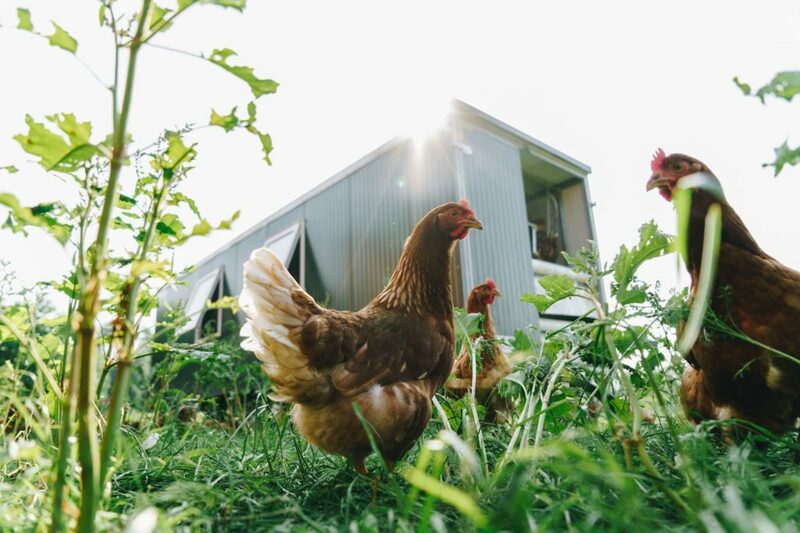 Besides being given the opportunity to graze on a fresh meadow every day, the hens also have large and protected scratching areas in the mobile housing system. In the daytime, they can reach the green pasture from there, and roam around freely. In the evening, the hens return to the mobile poultry housing system where they can spend the night safely and comfortably. Thanks to the high degree of automation, you will gain more time for your animals and you can devote more time to ensuring their welfare. Your layers will thank you for this with fresh eggs every day.